SKS carries amber and clear glass beverage bottles to package juices, smoothies, and liquors in various styles with both metal and plastic caps. SKS offers glass bar top bottles in 375 ml and 750 ml sizes with top-to-bottom features that provide convenient and versatile packaging for hard liquors. These glass beverage bottles feature sturdy bases with lightly ridged rings to reduce slippage and smooth, round bodies that can be easily labeled and silk screened. The tall, slender necks of the bar top bottles allow for smooth pouring into glasses or shakers. The neck openings are sized to fit bar top corks, which require no threading, offer a snug fit, and are free of rough edges on their tops for easy cleaning. Bar top cork options include black plastic and wood tops attached to natural and colmated corks. Colmated corks are similar to natural corks, except the cork pores are sealed. 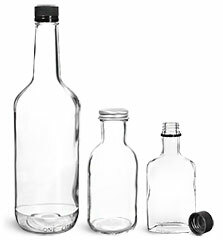 Clear glass flask bottles, available in 100 ml, 200 ml, and 375 ml sizes, are compatible with black ribbed tamper evident caps. These glass bottles are rectangular in shape, allowing for front and back panel labeling and an easy grip while pouring. Black tamper evident caps each feature a detachable ring that tear apart from the cap when first opened. Use clear glass stout bottles with aluminum caps to package home brews and distilled spirits with ease. These 12 oz and 16 oz capacity glass beverage bottles have broad bases with large openings. For a larger option SKS stocks clear glass liquor bottles, available in a 1 L capacity with tamper evident black caps. With a full height of 11.65", these clear glass liquor bottles make a statement on the shelf while displaying any variety of spirits including whiskey, vodka, and more. SKS provides larger capacity clear and amber glass bottles with handles for easy transportation and pouring. 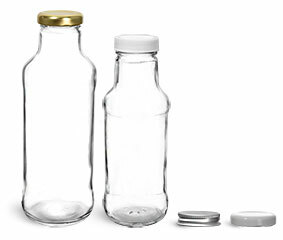 In a 1.75 L size, clear glass bottles are available with white or black polypropylene caps that include a tamper evident ring and pouring inserts for controlled dispensing. Clear and amber glass jugs are paired with black phenolic cone lined caps to reduce leakage and liquid evaporation. 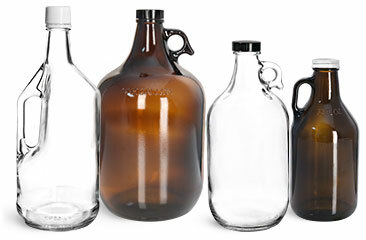 Both clear and amber glass jugs have handles attached to the neck of the bottles. The one gallon sized clear and amber glass jugs include an embossed "ONE GALLON" label on each side of the jug at shoulder height. An additional option for amber glass spirit bottles are 32 oz and 64 oz growlers. White metal plastisol lined caps are included with each amber glass growler. These bottles have handles at the neck and their sizes embossed on the shoulders. For non-alcoholic beverages, SKS has clear glass beverage bottles in a variety of shapes, sizes, and styles with several sealing options to best meet the packaging needs of your products. 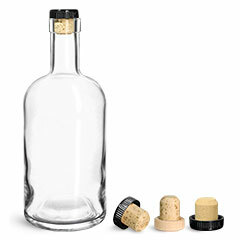 Glass beverage bottles with lug finishes are available in 16 oz and 24 oz sizes. Compatible white or gold metal lug caps may be purchased with the glass beverage bottles or separately. These caps include plastisol liners to create both a tamper evident and hermetic seal which ensures product freshness and safety. In a similar style, 10 oz clear glass beverage bottles with a continuous thread finish have a neck of 38/405 which is compatible with 38/400 white plastic caps and silver aluminum caps. SKS offers clear glass beverage bottles with an old fashioned style that can elevate your drinks with a unique appearance. 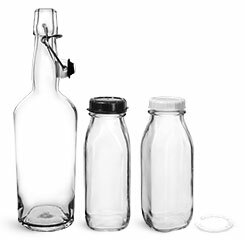 16 oz clear glass dairy bottles with white or black tamper evident caps have a soft, square shape and a 48 mm wide opening. This opening makes it easy to pour products, such as smoothies or milkshakes, into a glass or to drink straight from the bottle. The LDPE tamper evident caps include a specialized closure compatible only with the glass dairy bottles unthreaded neck. No threading on the bottle or cap means these tamper evident caps slide easily on and off the container, no unscrewing necessary. Glass swing top bottles have rounded shoulders, long slender necks, and swing top assembled caps. Wire construction allows the plugs to snap into place or hang on the side while the swing top bottles are open. The plugs create a seal while transporting and storing various ciders, juices, and sparkling waters. Whether packaging strong gin or fruit smoothies, SKS has a variety of glass beverage bottles to suit your needs. Need more ideas? Be sure to check our newsletters and industry idea pages!